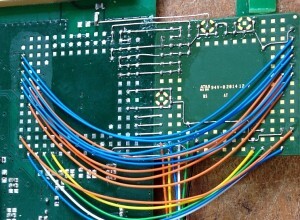 A close-up of an LGA module wired upside-down at the side of the PCB, supported by strips of FRP. The LGA pads are only 1mm apart, the wires are very thin and the soldering is very accurate. Recently we have been engaged in fault-finding a customer’s prototype product. This was designed and built elsewhere, but it didn’t work so they bought it to us for analysis. Most of the problems were fairly easily explained – given our arsenal of logic analysers and digital storage scopes there’s not much that we can’t track down. But one fault was proving more difficult to crack; the schematic looked fine but the big LGA module just wouldn’t talk to the processor. Finally we took the plunge and removed the module from the board altogether, and then wired up a new one upside down so we could properly check all the connections. 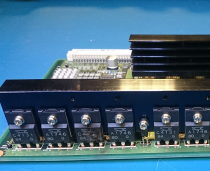 This masterful bit of soldering took a while, but when it was complete we were able to identify the fault – in a matter of minutes – as being a dodgy track under the module. With the fault corrected with another bit of tiny wire, the module burst into life and we were able to resume testing the board. The customer was very relieved to have this problem solved.